When the U.S. government surveyed the western states, they used markers to block out quadrangle shaped sections. A topographical map for each quadrangle was then created. The quadrangles are often imperfect in shape and size, but are usually about 7.5 minutes (a measure of latitude and longitude) in size and named after a local feature. 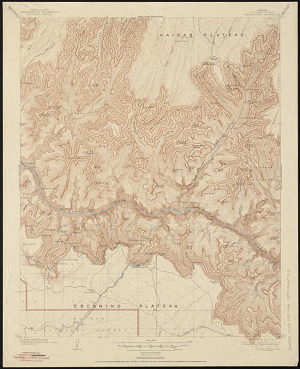 Despite their imperfections, the maps still provide a geologic tool for mapping the vast space of the western U.S.
"Arizona (Coconino County), Bright Angel quadrangle, 1903" by Geological Survey (U.S.) is licensed under CC BY. Interior. http://pubs.usgs.gov/fs/2002/0015/, accessed May 5, 2015. 2015 Historical Topographic Maps - Preserving the Past. US Department of the Interior. http://nationalmap.gov/historical/, accessed May 5, 2015.